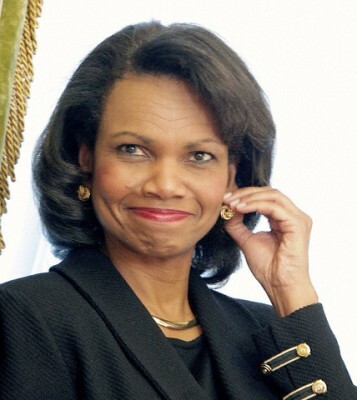 What do Madeleine Albright and Condoleezza Rice have in Common? Czech Mentors! Madeleine Albright and Condoleezza Rice are dynamic women whose influences on U.S. and world events had a significant impact on foreign policy decisions. Both served as U.S. Secretaries of State. Albright is a Democrat, politically a moderate. Rice is a Republican, politically a conservative. They are of different faiths, with different philosophic perspectives. Two powerful, but very different personalities, styles and beliefs. 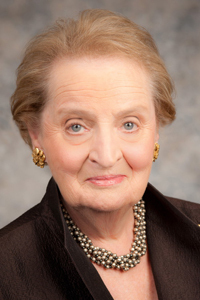 Since reading Madeleine Albright’s book, The Mighty and the Almighty, I have enjoyed discovering her world views, her life experiences and her views of the development of the U.S. as a nation and an international power. But I was still surprised when I learned of the political interconnections between Albright and Rice. It is all about mentors. In her book, U.S. Secretary of State Madeleine Albright, the 64th U.S. Secretary of State under President Bill Clinton, describes her values and beliefs. She describes being influenced by her father, Josef Korbel, a Czechoslovakian diplomat, and by Tomas Garrigue Masaryk, the first President of Czechoslovakia, in whose government Korbel served. Rice also identifies Josef Korbel as a major figure in her life. So, who are these men? And how did they influence two such brilliant and unique individuals? Tomas Garrigue Masaryk (1850-1937) was born in Hodonin, Moravia. He was a Professor of Philosophy at the University of Prague and a visiting professor at the University of London. He served in the Austrian Parliament from 1891 to 1893 and 1907 to 1914. He went into exile in 1914 and organized Czechs and Slovaks living outside Austria-Hungary. He developed a network of exiles who passed intelligence to the Allies while helping to establish the Czechoslovak Legions who fought with the Allies in World War I. He traveled throughout Europe and the United States from 1916 to 1918, encouraging allied leaders to force the “disintegration” of Austria-Hungary. When Austria-Hungary fell at the end of WWI, Masaryk became head of the provisional Czech Federation. He was elected President by the National Assembly in 1918, 1920, 1927 and 1934. He died before the Munich Agreement was signed in September 1938. Korbel briefly served in Masaryk’s government. Masaryk was raised Catholic and, as an adult, converted to the Unitarian faith. He married a U.S. citizen, also Unitarian. Albright describes him as an intellect who did not consider belief in God necessary to be moral, but did believe “religious faith, properly understood, did much to encourage and strengthen right behavior.” Masaryk considered humanism and religion to be intertwined, with religion ultimately being about showing respect for every person and helping others. Josef Korbel was born in what is now the Czech Republic. He was a young diplomat when he was forced to flee his homeland due to his Jewish heritage when the Nazis occupied Czechoslovakia. He would also have been at risk of arrest due to his diplomatic ties to President Edvard Benes, President of Czechoslovakia after Masaryk’s. He returned to his homeland after World War II, served as ambassador to Luxembourg, and fled again when the communists assumed power in 1948. Sentenced to death in absentia, he was given political asylum in the United States. It is little wonder he had a keen interest in democracy and a love for this country. Korbel ultimately moved to the University of Denver where he founded the school bearing his name, the Josef Korbel School of International Studies. Even though he was Jewish by birth, Korbel appears to have espoused no religious faith in his youth, and raised his children in the Catholic faith. Josef Korbel may be best known as Madeleine Albright’s father, but he was also a mentor to Condoleezza Rice, the National Security Advisor and 66th U.S. Secretary of State under President George W. Bush. She studied under him at the University of Denver and describes him as a central figure in her life. Her PhD dissertation dealt with politics and policy under communism in his homeland, Czechoslovakia. Both Albright and Rice credit Korbel with the belief that “democratic values are at the heart of peace and stability in the world.” Both women have reflected that Korbel considered the United States the “Indispensable Nation” because of its pivotal role in world affairs. They, too, share that belief. In understanding Secretary Albright, it is helpful to understand her admiration of Masaryk, her father, and the impact both had on her world view. In understanding her father, it is important to recognize that his beliefs were broad enough to nurture two women with such diverse points of view. It also gives us insight into the values that influence the beliefs of both women and their perspectives of faith and politics in interacting with world and national leaders. We journey on! This entry was posted in History, Legal and Government Buzz, Reviews, Tips and Words of Wisdom and tagged Condoleessa Rice, Czechoslovakia, humanism, Jewish, Josef Korbel, Madeleine AlbrightCzech Republic, Religion, Tomas Masaryk, Unitarian. Bookmark the permalink. Dear friends. We continue to get lots of viewers to this post. We would love to learn about the people who view it. I wrote it because of my research on Madeleine Albright, which led me to learn more about Condeleezza Rice. It appears that most of the people who read the article are focused on Rice. I am now thinking about doing research focused on Rice. Just curious, I guess. Thanks. Thanks for the great quote. I so agree. And mentors can have such a powerful impact on our lives. It is particularly fortunate to find women who are able to benefit from really significant mentors.